I was very tired, and I thought that 11. …Bh3 would confuse White immensely. My plan was that if 12. gxh3 then 12. …Qg5+ Kh1 and if I could manage it eventually …Qxh2 would put me very pretty. If, alternatively, White didn’t take and went 12. g3 then the Rook at f1 is now vulnerable. 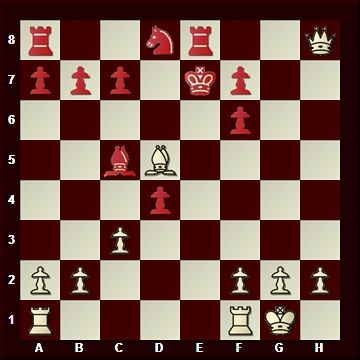 Now, White’s next move is irrelevant – the next move following whatever White chooses for move 13 is 13. …Qg2#. But I missed it. :O It happens. And I still had a fascinating game, and eventually the win. Entries (RSS) and Comments (RSS). 25 queries. 0.577 seconds.